It may be brand new but it already has a story behind it. Everything is made entirely in Montreal, featuring European fibers. Between its initial sketch and its arrival in stores, it travels from hand to hand, benefiting from every expertise it encounters along the way. It is the meeting point between art, technology, and know-how. 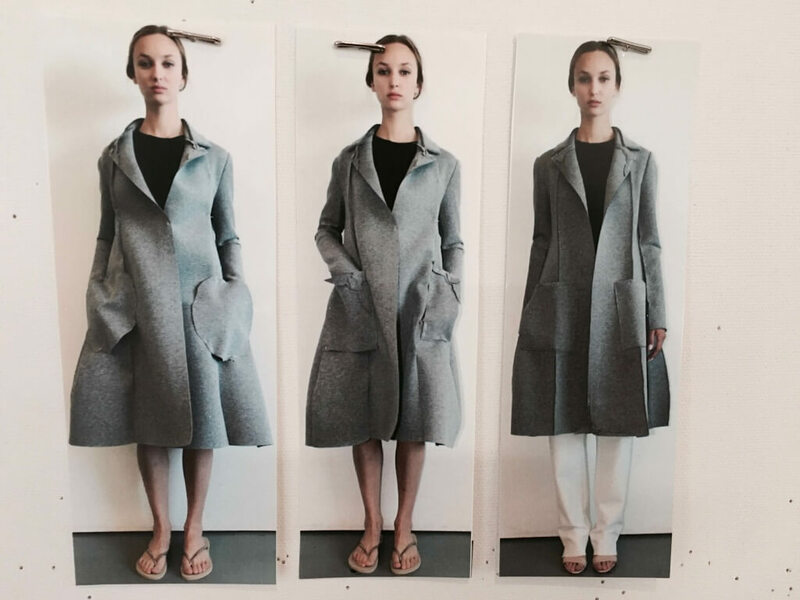 This is the tale of the journey of a Maison Marie Saint Pierre garment. Everything starts with the fabric. 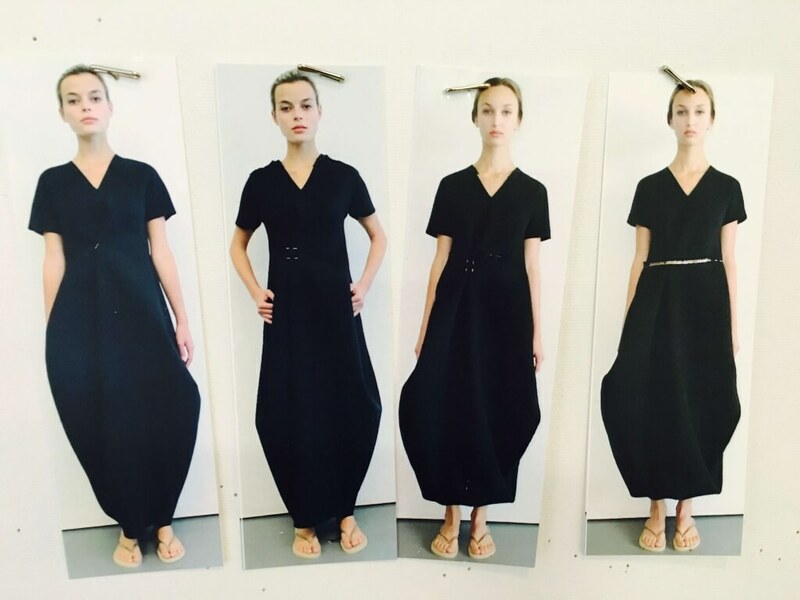 Marie Saint Pierre visits French salons like Première Vision, seeking new fabrics. The biggest names in textiles are present, at once strengthened by their heritage and agile in their capacity to innovate. Hands glide on swatches in search of unique textures… Feeling, weighing, imagining the transparency and emboss effects that will now be possible. Marie Saint Pierre heads home with only a few inches of fabrics. The reason is so she can conduct her own tests in the studio before completing her orders. Can such materials be fused to achieve the desired properties? From the outset, research and development have been part of the Maison’s DNA. Marie Saint Pierre additionally dictates colours to the manufacturer who will then dye the fabrics in an exclusive manner for her collection. Contrary to a large number of designers who work from sketches, Marie Saint Pierre opts for 3D and uses a direct draping technique called moulage on a live model. On said model, Marie Saint Pierre drapes, cuts, and pins so that silhouettes take shape before her very eyes. Now is the time to invent volumes all the while remaining faithful to the brand’s aesthetic. At a rate of two 5-hour sessions a week, this maneuver can take from two to three months for a single collection. Two developers support the designer in her work and a modeler translates the team’s wishes into digital mockups. These will enable the samplers to create a specimen of each garment which will in turn be handed to the sales team. With access to all of the styles, our marketing team can depict the narrative of the collection through images. This is the moment when filmmakers and photographers step in. In this time of abundance and instantaneousness of information, Maison Marie Saint Pierre has increasingly become a producer of cultural content. She thus calls upon renowned artists who draw from themes that are dear to the brand to illustrate its identity. The collection is then presented to department store buyers who attempt to predict their clients’ needs and wants. Creativity makes way for technique. 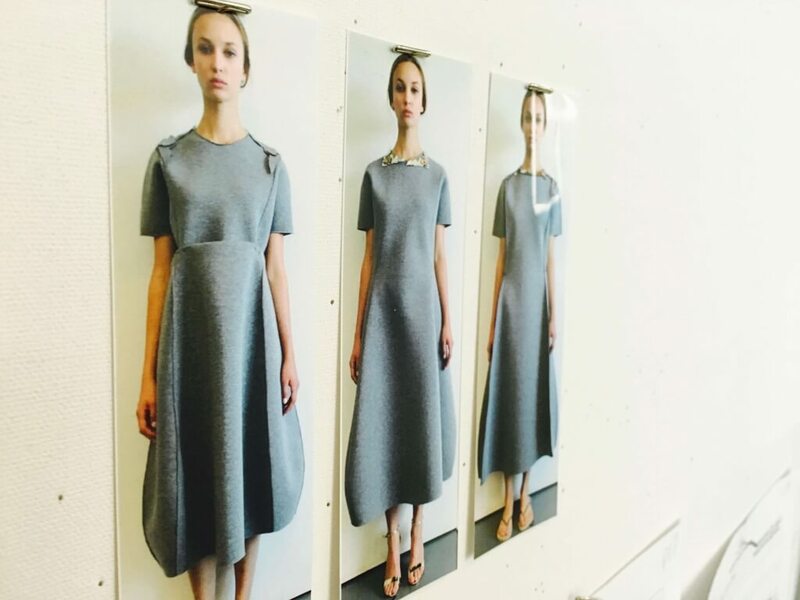 The sample designed to dress a professional model must now be made available for all sizes. Each and every woman must feel as beautiful in the Marie Saint Pierre garment as the image conveyed by the campaign. This is where mathematics and design meet - this step is so crucial and complex that the same trusted pattern maker is always called upon to make the gradation and nomenclature which will be used in the entire production. In a manner of speaking, he or she drafts the recipe to be followed, and it must be flawless. Once the patterns are drawn, the machine is switched on. In a Montreal workshop specialized in cutting, rolls of fabrics are spread out on long tables. They are carefully inspected, yard per yard, to avoid flaws, and then stabilized in order to counter stresses created by transportation. A robot cuts the fabrics to achieve a high level of precision and to minimize scraps. The assembly is entrusted to manufacturers versed in luxury. Each seam is ironed gradually to ensure a continuous quality control throughout the process. Assembling a single Marie Saint Pierre dress can take a skilled seamstress from two to five hours, depending on the style’s degree of complexity. Jackets can require up to three hours of work on sewing machines. All things considered, the process lasts between four to six weeks. Each garment is finally inspected before being delivered to the label’s head office where one last quality review is conducted before the labelling and final pressing. 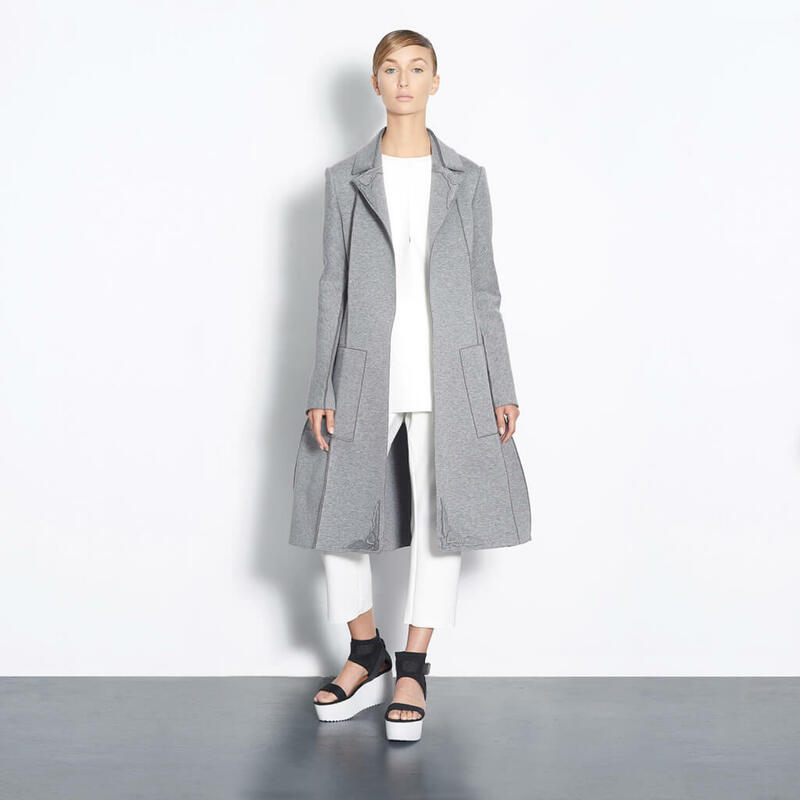 The collection is subsequently distributed in Maison Marie Saint Pierre boutiques in Montreal and Miami, as well as in fifty North American stores. A year has gone by since the kickoff of the narrative and yet, the story has only just begun.